After being hailed as the richest Indian in the world and the wealthiest in the United Kingdom, it has now emerged that India-born steel tycoon Lakshmi Mittal resides on Britain's most expensive street. In a list of Britain's costliest streets, the top slot has been grabbed by Kensignton Palace Gardens, popularly known as Billionaire's Row, where Mittal family has purchased three houses and was once home to late Princess of Wales Diana. As per a ranking of Britain's 20 highest value streets, compiled by property website Zoopla, London's Kensington Palace Gardens is top-ranked with an average house price of about 41.4 million pounds, while Compton Avenue in Hamstead, North London, has come as the distant second with an average price of 7.5 million pounds. All the 20 costliest streets in Britain are in London. Last month, Mittal reportedly purchased a 70-million-pound house for his daughter Vanisha in this street -- close after a world record 117-million-pound mansion bought for his son Aditya and the third for the family in the same area. 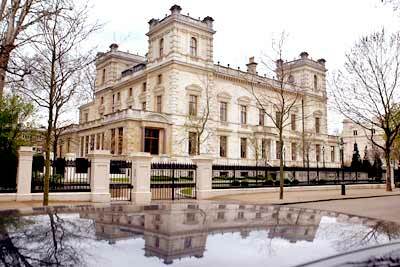 About four years ago, Mittal had purchased his first house on the Billionaire's Row for 57 million pounds. amount paid for these properties over a period of four years. The street has been home to a number of celebrities even before Mittals came here. Late Princess Diana once lived in this street in the Central London and its current residents include Chelsea Football Club owner Roman Abramovich. Kensington Palace Gardens is a private avenue lined with trees and dotted with foreign embassies. In May this year, Mittal purchased a lavish property near Israeli Embassy for a world record 117 million pounds from hedge fund tycoon Noam Gottesman. This property is said to be inhabited by Aditya Mittal, Mittal's son and group CFO of ArcelorMittal, along with his wife Megha and two daughters. Mittal's latest acquisition on this street was formerly a Philippines Embassy and is being furnished for Vanisha, also a board member of ArcelorMittal. Mittal owes much of his over $50 billion fortune to his stake in ArcelorMittal, the world's biggest steelmaker valued at over $100 billion. While Mittal's 117-million-pound purchase of second house in this street is said to be the most expensive residential property deal so far in the world, as per the US business magazine Forbes, the costliest home across the globe is being built by India's richest resident Indian Mukesh Ambani. The 27-storey skyscraper being built in Mumbai by Mukesh Ambani could be the world's largest and costliest home with a price-tag nearing $2 billion, according to Forbes. In March, Ambani was ranked as the world's fifth richest with a net worth of $43 billion by the Forbes magazine in its annual list of world's wealthiest. While Mittal, who is an Indian citizen, was ranked higher at fourth, he is a British resident. Among resident Indians, Mukesh was ranked at top. In the latest list of costliest streets of Britain, compiled by Zoopla, Kensington Palace Gardens and Compton Avenue are followed by Courtenay Avenue, Chelsea Square, Manresa Road, Ilchester Place, Spaniards Close, Elm Walk, Essex Villas and Gilston Road in the top ten.